Noam is the CEO and Founder of DAV. Despite its ubiquitous presence in everyday life, it is easy to forget that the internet is still a young technology. Recalling a time before the internet isn’t difficult for some – but it isn’t ideal to think in terms of pre-or-post internet, because its reception was not a big bang but rather a slow crawl. What once served as an infrastructure for academics to quickly share knowledge spread to commerce, where it bloomed in the 90s before becoming the worldwide web we know today. More importantly, the internet has gone from its rigid and siloed nature into an interconnected user-generated landscape thanks to the expansion of social media. This new trend allows people to express their identities and interact online, but even this is changing. With the rise of the mobile economy and its merging with new technologies like blockchain, the traditional web is being left behind. The mobile economy represents a lucrative opportunity for innovators, who can reach consumers more directly but also less expensively. This is possible due to the greater emphasis that a shifting internet has placed on the individual, but also the superior autonomy lent to single users who no longer need to operate via centralized authorities. There are several factors that have spurred the rapid rise of the mobile economy. Quick advancements in hardware and online communications, along with the emergence of smartphones, led to several key innovations in the field. eCommerce, which had already taken substantial market share from traditional retail, was a natural fit for this emerging sector. The growing “accessibility of mobility” also means that people are always connected and capable of more complicated tasks on either side of any transaction. Mobile became a standard for business considering it provides greater agility and quicker response times for anyone from a CEO to a freelancer working on a deadline. The nascent “gig economy” and other new economic models are directly tied to how efficiently mobile technology connects the world. The mobile economy once again decentralized communication, allowing users to dispense with the stationary and take their personalized online worlds on the go. However, the applications and websites that people rely on to monetize their skills—such as TaskRabbit, Fiverr, or Freelancer.com—are still centralized. Now, the combination of mobile and blockchain has led to a new stage of the mobile economy. The integration of blockchain with the mobile economy will mean freedom from these middlemen, and better services based on data that can be attributed to individual peers specifically. Instead of static content, or even user-generated content served by a centralized source, the mainstream is starting to experience the proliferation of peer-to-peer services as the most viable model. Peers don’t have to be people, they can also be mobile devices or anything capable of a remote connection. Adding blockchain to the mix means that these peers are trustworthy to both serve and be served content or data. What Can We Do in a Trustless Mobile Economy? The expansion of the traditional web brings a set of familiar and new opportunities to industries in certain verticals, such as AI companies, automakers, ride-hailing services, drones, insurance, and more. Just as the internet once offered new models itself, the blockchain-supported mobile economy will see a plethora of pipe-dream ideas form the new reality very quickly. Autonomous vehicles, for example, are still in their early phases but will evolve more rapidly when each car is able to project information about itself without a centralized processing unit to enforce authenticity. Vehicles and smartphones are both central to the idea of the mobile individual because one gets us to where we need to go, and the other keeps us connected wherever that might be. Accordingly, both are also compatible with decentralized ideas. A car connected to a blockchain network can transmit measurable information about themselves (gas level, number of passengers, maintenance requests, availability status, insurance coverage, etc.) to relevant nodes on the IoT (Internet of Things) almost instantly. It suddenly becomes possible to find a ride on the blockchain without fee-gathering middlemen, but also to obtain specific ride-related services based on data coming from any passenger’s own mobile device. A New York cab being hailed with blockchain technology could understand that the phone’s user requests full insurance coverage for the duration of their ride, and could autonomously and instantly apply the cost of this temporary insurance to the fare. The driver would receive the relevant fare without the app taking a fee, the insurance company would receive the ride’s premium, and the passenger wouldn’t be charged extra for their customized blend of connected services. A similar scenario could play out for a drone service run on the blockchain. One’s mobile device can act as a geographical pin for someone ordering food via drone, for example, so that they no longer need to remain stationary to receive their delivery or pay for it. People using a mobile interface to connect with a similar service in their area could see a real-time map of drones available and their capabilities (delivery, photography, etc. ), and employ the drone on-demand, with payment being sent automatically to the owner’s blockchain wallet. In addition to connecting with consumer-facing services in their wheelhouse, drones would simultaneously be nodes in a network which employs blockchain to increase swarm intelligence and efficacy. With blockchain, value can be generated and consumed without needing to travel through an intermediary, naturally lending greater autonomy to mobile members of a network. Entrepreneurs and enterprises are faced with a great opportunity, both to build and to populate new decentralized networks. Whether it’s creating the infrastructure that helps companies deliver better services or using the infrastructure to offer stakeholders a way to leverage their value, the next stage of the web is approaching fast. Catching the wave and sustaining the momentum will mean a central and lucrative place in the new status quo. DAV is a blockchain-based transportation protocol which enables a decentralized, peer to peer, global transportation network. 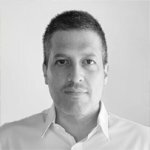 Noam is a senior executive, strategist, and investor, with a strong expertise in blockchain, cryptocurrencies and encryption. In 2003 created the world’s first smartphone encryption system distributed in over 50 countries. Noam is an aviation enthusiast and a multi-engine rated pilot.